It feels like writer/director Terrence Malick is beginning to repeat himself. There isn't much to differentiate Song to Song from his last film Knight of Cups. The latter was pseudo set in the mind of a film maker, this one a musician (or musicians) but in both cases that aspect of the character is so relegated to the sidelines that you would be forgiven if you forgot it entirely. 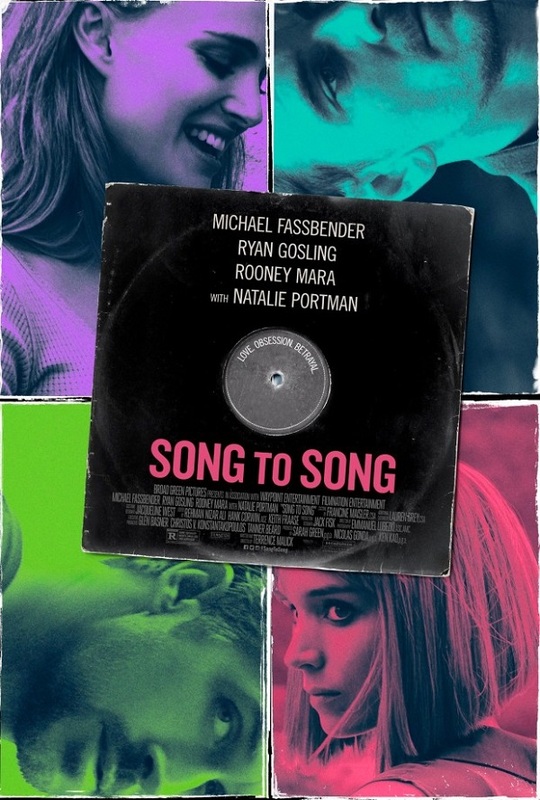 Song to Song's main failing is not its genericness. There is somewhat of a richness to his slice of life approach, his everyman kind of stories. As usual he has filmed something strikingly beautiful, setting his introspective subjects in beautiful environments, here mostly unique modern character homes, to fret over their own insecurities. The main failing is his lack of connection to the characters. Here he follows the relationship of musicians Ryan Gosling and Rooney Mara as they meet, fall in love, fall out of love or at least loose sight of it, and reconnect after experiments with others which don't work out. Not only does he fail to connect either of them to their music (they both appear so detached from any music they are playing, singing, or listening to) but he fails to connect them to each other. Their chemistry never feels honest or real. I never believed they loved each other. I reflected on this. Were we supposed to see them as doomed in their lack of relationship? I never felt the film was making that point either. It truly felt like he was just not able to get his film's central conceit realized. There is a subplot about the Machiavellian Michael Fassbender and his corruption of the two romantics. Fassbender is the most realized character, actually getting to be a complicated and destructive figure. Around him the rest of the film feels cliched and a bit hopeless. Especially Natalie Portman's inexplicably wedged in character who offers absolutely nothing to the progression of the story. At least the waster Cate Blanchett actually has an impact on Gosling's arc. Portman's journey feels wasted, even at the point of its most impactful, Fassbender just moves on. I appreciate Malick's freeform approach and when he has a fascinating story to tell (like in The New World) it can work to create something spectacular. But he needs to find that story to make me care about all the beautiful musings of fashionably dressed subjects standing morosely next to infinity pools.